The four-cylinder engine that was supposed to be the saviour of the Ford Falcon has failed to set sales charts alight – despite being the most fuel-efficient Falcon ever made. Ford and its employees have bought three times as many four-cylinder Falcons as private buyers in the car’s first three months in showrooms. 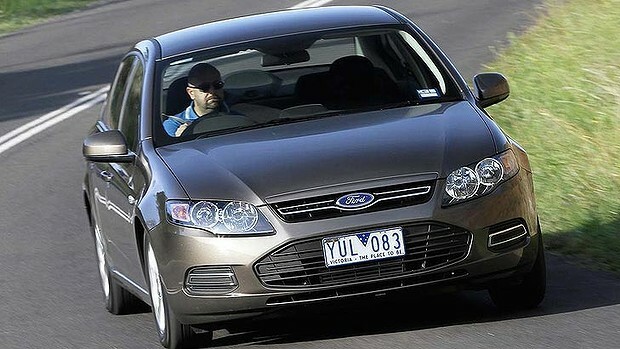 The Federal Government – which injected $230 million of taxpayer money to support the development of the four-cylinder Falcon and diesel Territory in 2009 – has bought just two of the “eco” sedans in the past three months. According to confidential sales figures obtained by Drive, Ford Australia and its employees bought 159 four-cylinder Falcons in April, May and June – compared to 53 to private buyers and 101 fleet buyers for the same period. State Governments accounted for 22 sales while local councils accounted for just 13 deliveries. Overall, the four-cylinder model made up 10 per cent of Falcon sedan sales in its first three months in showrooms, or 355 of 3448 deliveries. The LPG Falcon also accounted for a further 10 per cent of sales. At the media launch of the vehicle, Ford said it hoped the four-cylinder “EcoBoost” model would eventually account for 25 per cent of the Falcon’s tally. The slow uptake of the four-cylinder variant indicates that fuel economy may not be the primary reason for buyers leaving the large-sedan market. Falcon sales are at their lowest in the 52-year history of the nameplate and the model is now outside the top-20 sellers. The four-cylinder EcoBoost model is the most fuel-efficient Falcon ever made – its acceleration is identical to the six-cylinder (0 to 100km/h in 6.9 seconds). Only towing capacity is diminished (2300kg for the six-cylinder versus 1600kg for the four-cylinder). Ford said it only planned to sell 2000 four-cylinder Falcons this year; if sales continue at the current rate they won’t hit this target. “If you look at the experience with the Ford F-Series pick-up in North America [which made Ecoboost power available alongside its V8s last year], the take-up was initially very low. But now it represents about 40 per cent [of sales]. “[The large-car market] is a very challenging segment, and we have got to keep addressing it,” says McDonald. Ford says the controversial cane toad advertisement – used to promote the surprising pace of the four-cylinder Falcon by crushing a cane toad – did not backfire, despite complaints from some animal welfare groups. Part of the reason for the four-cylinder Falcon’s slow take-up may be that it is not available in the XR6 styling package – only the plain-looking XT, G6 and G6E fleet models are available with four-cylinder power. "FORD has been buoyed by better than expected car sales figures from last month, with Territory sales at a five-year high and Falcon figures up nearly 50 per cent on the previous month." Sad to see the uptake wasn't as quickly as thought...lets hope it does pick up as people start chasing fuel economy for family sedans. I guess the pricing may also be a factor. If the Falcon sold for a little cheaper or with some extras...that might help. XR6 4 cylinder turbo...just doesn't work. They'd need to make a whole new platform of "sports sedan" for the 4 cylinder turbo version. Hopefully one day some boffin at Ford Oz will do some witchcraft with a calculator and realise the price of a Falcon as a percentage of an average wage has risen to a point where it isn't viable for families to buy new. Families that do have a high enough income for a new Ford buy a Territory. The Falcon is too big and too costly. Going the way of the dinosaur because they refuse to adapt it. It should be roughly the size of the mondeo (the boot on those things is insane), maybe 10% longer/wider, use up to date constrution methods to keep weight low, and cheaper as a result of being smaller. When you can do the family school run in a Focus, why, WHY would you spend the extra 15 thousand on a Falcon? They talk about certain things not making a "good business case" in the insudtry, well... how about building a falcon that makes "good business sense" to buyers? Not knocking the current car- its a bloody ripper, the best ever, but does it fit the market? No, not as a volume seller it does not. i havent even seen any advertisement on this car other than fordmods lol. typical of ford, holden drums it into our heads when they make a new model car weather it be the 6.0l clubby or even the barina spark. the only ad i ever see on tv for ford is the little fords like the focus etc..
the only advertising that is done is not seen on TV and is seen as a joke by the execs.. fuken genius in the marketing dep. Ford could have sold ECO LPI 6's by the bucketload by putting a variation of that "how far can you go on 2 dollars" youtube clip on TV and radio. 1. It showed the LPG Falcon significantly out accelerate a petrol direct injection commodore. 2. It showed the same falcon able to drive more than twice as far as the commodore on 2 dollars worth of fuel. The fact that Ford didn't make a big deal about that... is why it hasn't been selling. So true. Ford has stuff all marketing/advertising. I don't remember the last time I saw a Ford ad on the TV. Seems like they are relying on Ford enthusiasts to make a fair whack of sales up... just won't work. Easy solution to the sales issues. Step 1. Sack the whole marketing department, they can't market s**t to a farmer! Step 2. Outsource the marketing to a small trendy company that will make ads we can't forget! Step 3. Price them to better suit the "family" they are intended for, ie, to fit their income level. Step 4. LPG Version for the Taxi Fleets - factory. It can be done Ford! Step 5. Sports "XR(insert number here, ie 4)"
Step 6. Have trouble keeping up with all the orders! A sorts model, like a Xr4 might be the kick in the pants the sales really need, let's face it, the base Xr6 is really popular, why the hell wouldn't a spruced up 4cyl turbo be popular too? I'm sure it will sell more than a plan taxi looking car! Also, they need a LPG version to sell them to the taxi fleets, then sales will really kick off! personaly i think their issue is that they have built previous falcons to well. Is there a reason why Taxis don't run the LPi? I mean fuel economy is decent, power/torque better than unleaded. You lose a bit of boot space, but that's a small compromise. Regarding the "performance" version. I was thinking the XR4T, however there is already an XR4/5. You'd need to change the whole name away from the XR6 theme though. In saying that, the 4T was designed to take over the 6 cylinder...not for power, but for economy. So a performance 4T in a Falcon will be some what of a laughing stock. Stick to the 6 for the performance range while keeping the 4T as family themed. Maybe making the stock XT look a little bit more aggressive might improve it. It does look bland. The G6 and G6E are fine IMO as a class model. yea how are people surpose to buy something, that they don't know exists? I would have laughed at someone if they told me, without an article to prove it.